Let's first take a look back at the kitchen when we first moved here... I'll show you the picture, then touch on a few changes I made before deciding to paint. Wow! To me, this doesn't even feel like my house! The very first thing I did was remove the fruit on the wall, and the valance on the window. Not my colors or my style so down they came! Honestly, we lived with the kitchen just like this for about 6 months. The first BIG change I made was with paint and wallpaper. So I started by painting the walls in Fashion Grey by Behr. The grey color really helped tone down the orange in the cabinets. I also added the faux brick back splash. This is a textured, vinyl, wallpaper that can get wet and be scrubbed clean! I purchased it at a shop local to me, but I have seen similar styles available on Amazon, search brick wallpaper. 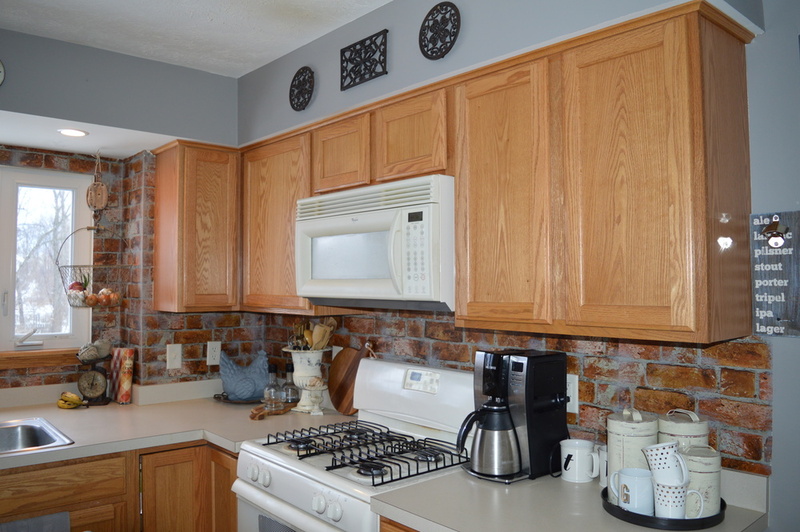 The tones in the brick married the warm tones of the wood cabinets with the cool tone of the gray paint. Another easy change was simply removing the cabinet doors to allow for a little display. 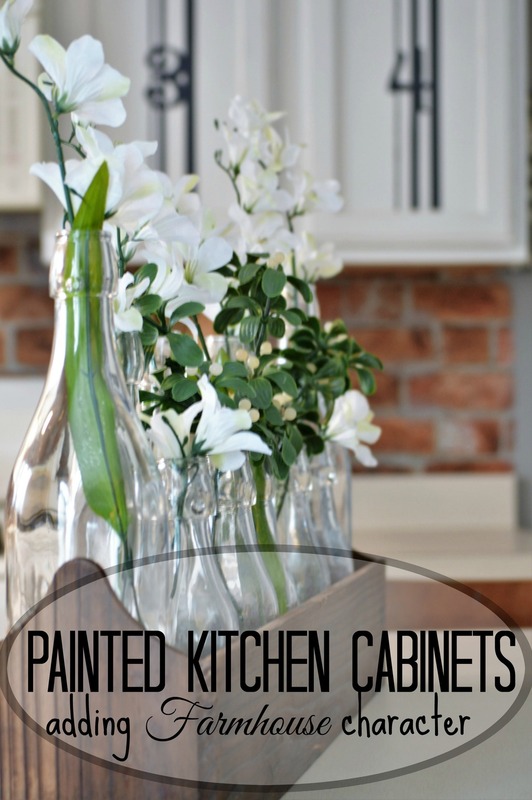 This is a quick way to add character to any kitchen and all you need is a screw driver! 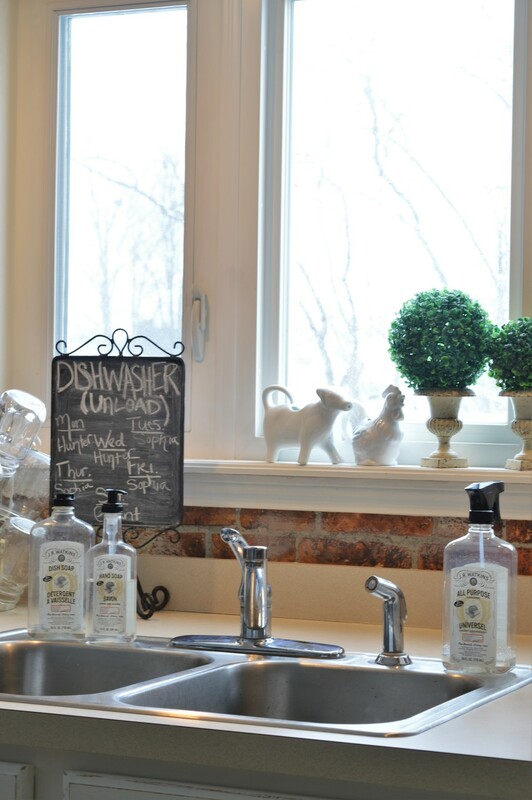 The other changes were just decor, like this farmhouse sign I DIY'd. It went a long way in adding some farmhouse flair to our kitchen. You can see the tutorial to make your own farmhouse sign, here! These changes kept my eyes happy for about a year! Just before this past Christmas (to see my Christmas home tour, click here), I had the urge to dive in and just do it! Paint the cabinets that is. I had been slowly removing the orange oak throughout the rest of the home, by painting all the trim, door casings, baseboards and moldings. A large part of that was in our dining room makeover and the hallway transformation. Now it was the kitchen's turn! I do not have a full tutorial on painting the cabinets. There are so many great ones out there via Pinterest, I don't need to write another one. I will tell you the basic steps I took. I gathered my supplies which included, Behr paint in antique lace and a custom color match to Americana Decor chalky finish craft paint, in Relic. 2 angled paint brushes and 2 foam rollers, painters tape, a medium and fine grit sand paper, TSP (for cleaning), kilz primer (because it's what I already had), and Minwax furniture paste (finishing wax). I stared by thoroughly cleaning the cabinets (which was probably the first time I had done that, shhhhh!) with TSP. It cuts the kitchen grease and grime like magic, I bought it at Home Depot. Then I removed the door fronts on the top cabinets only. I gave the doors and boxes of the uppers, one coat of primer. Then the actual paint color. I cut in the edges and corners first then rolled the remaining with the foam roller, front, back then front again. While the door coats were drying, I did the upper boxes. Working on just one section at a time was helpful to me because I was doing this on my kitchen floor! I repeated the steps with the lowers. I sanded them all, around the edges for a weathered look with the medium grit sand paper and then all over with the fine grit. I then applied the wax to the boxes and doors, 2 coats, buffing in beween. As you can see, I chose to paint my main cabinets along the wall all in the white color, and the island base is the color match to Relic. So sorry for the terrible, late night shot. I am not sorry to say, I completed this part of the project in less than 48 hours! My hubby and kiddos and pets were extremely grateful! Literally the next day, I decorated for Christmas! Fast forward to January (no, I will not admit what day I finally took the decorations down! ahem... the 11th, don't judge!). All the wreaths were gone and my kitchen seemed so bear, to bear, it needed something! The brain was working overtime. I don't currently have the budget for hardware, that will be a future project. And because of that same pesky budget, it's not yet time to tackle the counter tops (but soon!) or the flooring. I already know paint makes a big impact, and I already have paint...what could I do with paint? I put my love of grain sack stripes and numbering everything together....and came up with this! Also, say "hello" to my new friend Bessie. She is a sweet metal cow from Ragon House Market and I love her! Yes, I know she is blocking the cabinets above the microwave....who uses those anyway? I wrote a short tutorial on adding stripes and numbers to your cabinets. Now, lets just look at the pictures of the after! I'd say this builder grade kitchen has come a long way toward being a farmhouse kitchen! And because I LOVE a good before and after lets take one last look back at the kitchen when we moved in. And now the kitchen today! Please feel free to Pin any of my images to Pinterest for your inspiration later! Thanks for joining me in the journey from boring builder grade to farmhouse flair. I hope you check back in soon, you'll want to see the plans I have for the counter tops and flooring! You can also find me on Instagram, Facebook and Pinterest... hope to see you there!